Forecast Bar is the next best thing to having Dark Sky on your Mac. 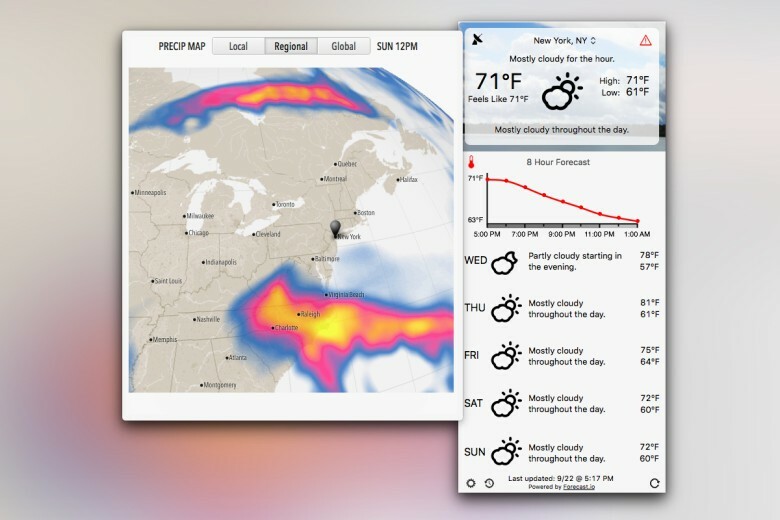 Forecast Bar brings all the features you love about Dark Sky to a Mac app. Not only does it look similar to Dark Sky, but it’s powered by the same Forecast API which means you’re getting the same accurate weather predictions. Forecast Bar also works the way you want it to. Keep it in the menu bar or let it sit in your dock. 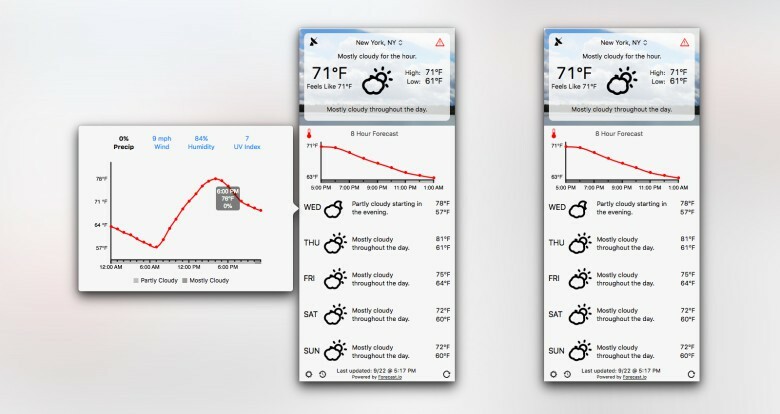 Enable certain notifications and display a 3-day, 5-day or 7-day forecast — up to you. With its detailed weather and range of customization options, it should very quickly take your Mac by storm. Whether you keep Forecast Bar in your menu bar or in the dock, it’s clear the app was meant to be in your menu bar. It works just fine as a dock app, but the window is still tall and slender as if it’s supposed to be dangling from the top of your screen. Don’t let the small footprint fool you though, Forecast Bar is packed with important weather data. At the top, your standard information about the current conditions is prominent as it is in most weather apps. At a glance you can see the current temperature, high and low for the day and a description of the current weather. This is also where you add or switch locations, view a radar map or get details for severe weather alerts. The accuracy of the Forecast API seems to vary based on your location, but when you’re in one of its better locations, it’s hard to find something more reliable. Underneath that is where the similarities to Dark Sky really become apparent. By default, a chart will show your 8-hour forecast. However, if rain is on the way within the next hour, this chart will switch to a detailed view of precipitation in the next hour. Below that is the extended forecast, which you can customize the length of in the app’s preferences. Additionally, you can click any part of the app — whether it’s current conditions, the hourly chart or the extended forecast — to get more advanced details. These include wind, humidity and UV index that are cleverly organized in pop-up charts alongside the anticipated precipitation amounts. At the very bottom is Time Machine, which lets you pick any date over the past 70 years and see the weather on that day. The Mac App Store has been pretty void of any decent weather apps for several years and it’s nice to see a solid entry make it through Apple’s gates. Carrot Weather debuted on the Mac recently as well, which is also powered by the Forecast API. It remains one of my absolute favorite picks. Meanwhile, Dark Sky has garnered a pretty loyal fanbase on iOS. It features comprehensive forecasts, a pretty decent design and its famous down-to-the-minute weather predictions. Its developers haven’t gotten around to releasing a dedicated Mac app, but they do serve up the Forecast.io website and Forecast API for other developers to take advantage of instead. Forecast Bar is $5.99 in the Mac App Store, which is less expensive than Carrot Weather, but it does come with some very odd in-app purchases. The app will refresh data every hour, but if you want more up-to-date reports, you’ll have to get them with a purchase. 10-minute updates cost you a one-time fee of — wait for it — $29.99. I can’t see why anyone would pay for that, but the good news is you don’t have to. Overall, Forecast Bar is a reputable new weather app for the Mac. For six bucks, it’s one you should consider adding to your menu bar. This entry was posted in Apps and tagged apps, Dark Sky, Forecast+, Mac, menu bar apps, Weather. Bookmark the permalink. Apple Releases iOS 9.0.1 for iPhone 6s and iPhone 6s Plus.